I'm concerned that the tree roots will take in the chemical and deposit into the fruit which will be eaten. 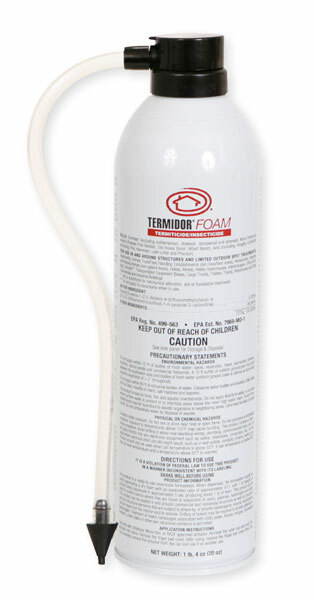 Termidor foam is designed to be used inside of wall voids and on wood, not applied directly to the soil. Termidor SC is a soil treatment. It is mixed with water and applied into a trench or small channel dug directly next to the foundation wall of the structure. In most cases, trees have feeder roots that extend up to 2 times farther than the branches or canopy of the tree. So if the Termidor is within 2 times the width of the tree, their is a small chance that it could be absorbed. In most cases, as long as you don't apply it within the drip line itself (branches) it would be ok. The directions say "within 1 foot of the drip line". Termidor is not water soluble once applied, doesn't leach through the soil and normally doesn't move once applied.